This isn't going to be much of a Wednesday Yarn Along post. 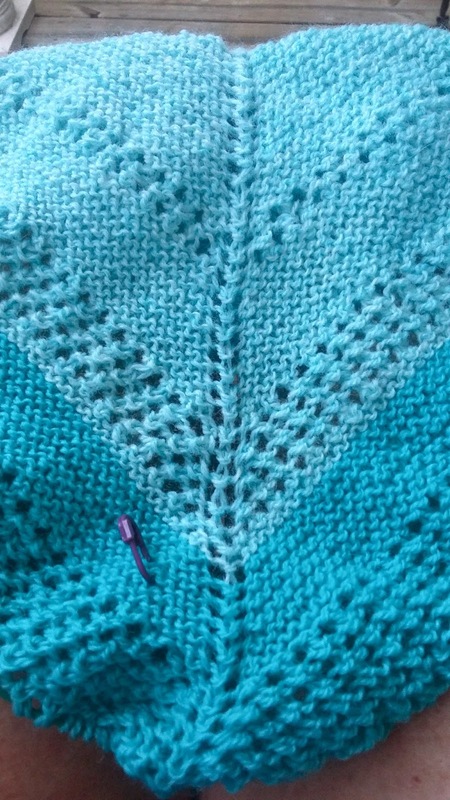 Over the past week, I've only knit about five rows on my modified Reyna shawl. I've knit just enough to consider frogging the whole thing. 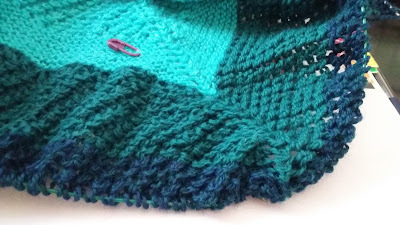 I ran out of the green yarn much earlier than expected and had to start the navy in the middle of the lace section instead of at the planned start of a garter section. I don't like it, but I think I can live with it. 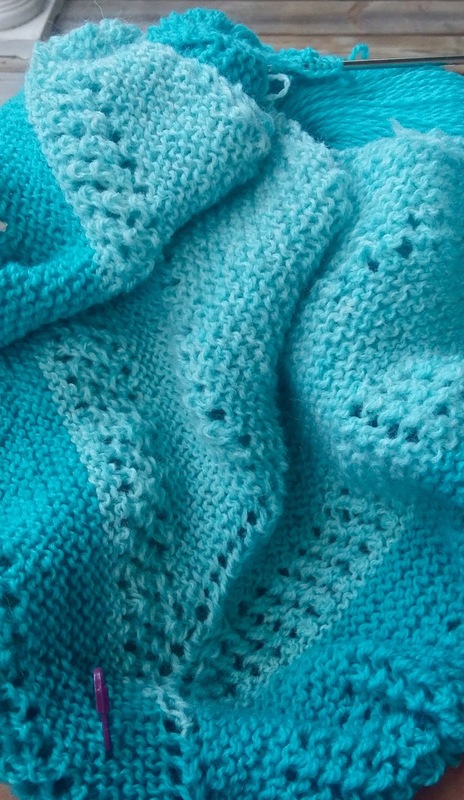 Except, the more I look at the shawl, that bright aqua blue looks like a cheap, $3.00 Walmart shirt instead of my favorite aqua/turquoise/warm seas color. And now that I've had that thought, Walmart is all I see when I look at it. I really don't want to end up with a shawl that looks like it cost $3.00 and came from Walmart. 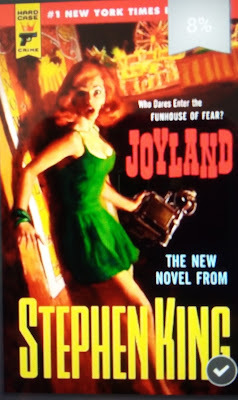 As for what I'm reading, I'm a whole one chapter into Stephen King's Joyland. I love a good scare and I've never met a Stephen King book I didn't like, but I'm almost afraid to turn the pages in this one. Working at an amusement park and knowing in advance that this book will cause me to freak out over something silly at work on a daily basis.... Not to mention, one of the rides already mention in Joyland is called the Delirium. Guess what King's Dominion's new ride is called. Yep, it's the Delirium. Chapter One & I'm already afraid to go to work. Oh, and did I mention the main charector's name is Devin. Guess what one our department supervisor's name is. You guessed it! She's a girl and spells it a little differently, but still. I wonder how it will go if I call to say I'm too scared & freaked out to come to work. Meanwhile, yesterday was my day off but I got no knitting or reading done because Minnie and I took a little road trip to the vet. Minnie has a cyst-thing that suddenly popped up, and popped up in a big way, right in front of her ear. We tried out a new vet yesterday and I'm SO glad we did. The vet we've been seeing is convenient, but that's about all I have to say for them. When I called to make an appointment with them, I was told they only have a doctor in one day a week. It's a veterinary hospital! What kind of hospital only has a doctor on staff once a week? I called a friend who works for Ashland Veterinary Hospital and presto magic - we got an appointment on the requested day, had a Wonderful experience and now consider them our new vet. In all my years, I've never had another vet go to such lengths to make an animal feel comfortable and less nervous. Minnie does NOT like going to the vet and normally she has to be dragged in to the vet's office. Literally dragged. But AVH (for short) smelt friendly enough to her that she walked right in, she never weirded out and peed on the floor and by the end of the visit, she was eating (literally) out of Dr. Gretchen's hand. I can not express how pleased I was with our visit there. If you're in the area and looking for a vet, please consider AVH. To find out what others are knitting and reading, check out the many Yarn Along posts on Ginny's blog, Small Things. Mike and I are celebrating our 23rd wedding anniversary today. And it's pretty exciting. 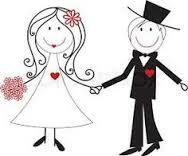 It's exciting that we are still happy together. It's exciting that we haven't killed each other. We don't fight often, but when we do, the fights tend to be epic. Epic fights over silly stuff, like whether we should buy mint chocolate chip or strawberry ice cream. (It's true. About 99.9% of our epic fights have occurred in the grocery store! What does that even say about us??) And it's exciting that we finally know how long we've been married. Mike and I are definitely not 'most people.' We aren't the mushy, love & roses type. We decided to get married, bought the rings & said the I do's all within about three weeks time. We got married in the magistrate's living room with only our parents & siblings in attendance. We didn't even make reservations for a honeymoon suite. We went fishing on our honeymoon. Fishing! (See, it's a wonder I haven't killed him yet.) Can you even call going fishing a honeymoon? Starting our marriage out by going fishing may be part of the reason I've blocked our wedding date from memory. Happy 23rd wedding anniversary, Mike. Despite my sarcasm and complaints about going fishing, I wouldn't have changed a moment of our time together. Not even the fishing trips. Despite your choice of ice cream flavors, I still love you and am looking forward to the next 23 years. Happy Anniversary! 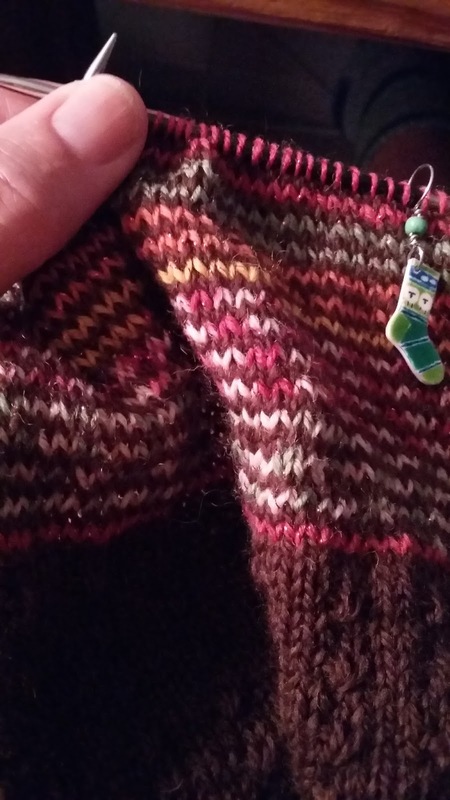 I am this close to finishing my Autumn Stripes cowl. As I mentioned yesterday, I got a new fish and I'm oddly excited about it. I've missed watching my old Beta fish swim around in his bowl. Watching him was amazingly relaxing. So anyway, I've been wanting to get a new fish for quite a while. I've put it off though because the fish store is waaaaay on the other side of all the other stores I go to. Buying a new fish would mean making a special trip, all the way to the other side of town, just for a $3.00 fish. 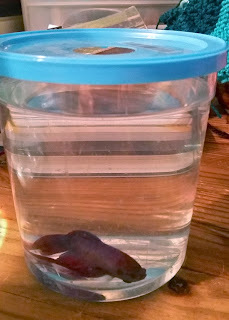 Yesterday, I got the brilliant idea of simply buying the fish then taking him with me to run errands and grocery shop. I would have taken pictures of New Fish (he really needs a better name) at the bank, the craft store, the car parts shop and the grocery store (he's a very well-traveled fish!) 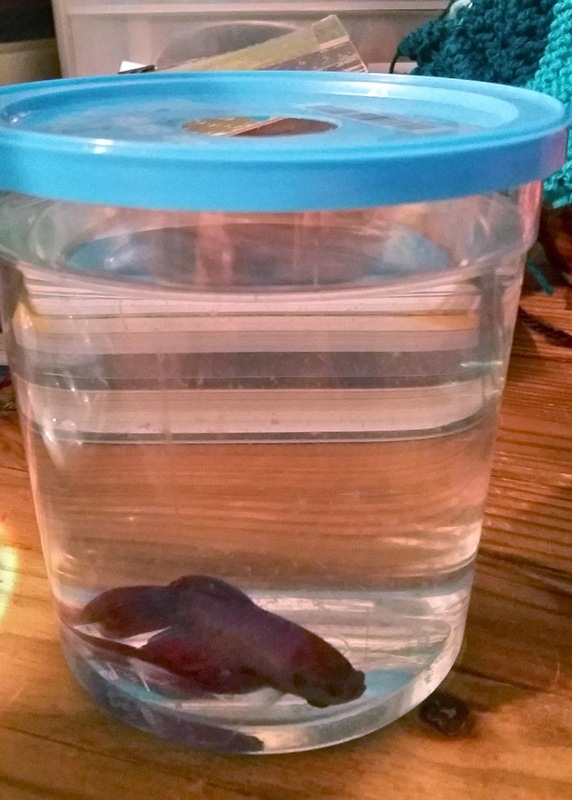 but I was getting enough weird looks just walking around carrying a fish in a cup. I was afraid of the attention I'd draw if I started taking pictures of our adventures. 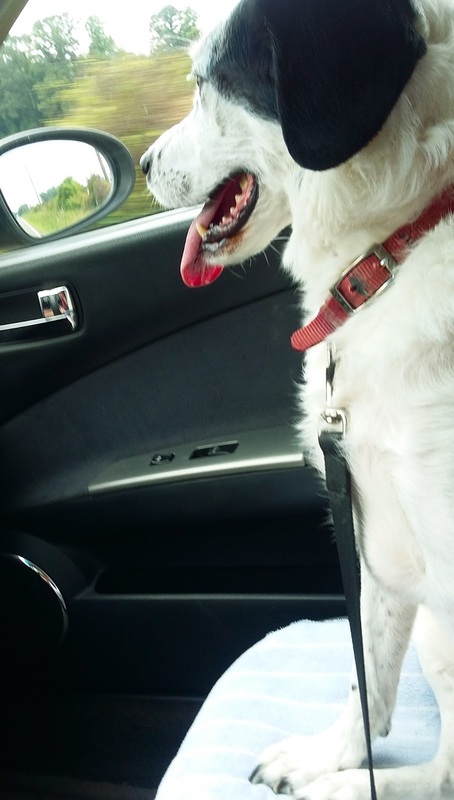 I was also a little bit afraid of the nervous breakdown I might be giving him lugging him in and out of the car and all around so many places with weird sounds, smells (can fish smell?) and bumpy shopping carts. New Fish seems to have survived this adventure yesterday and seems to like his new home. He's a little freaked out over his plastic plant. When his fins brush it as he swims past, he does that hyper "something touched me!" thing but hopefully he'll get used to it in a day or two. 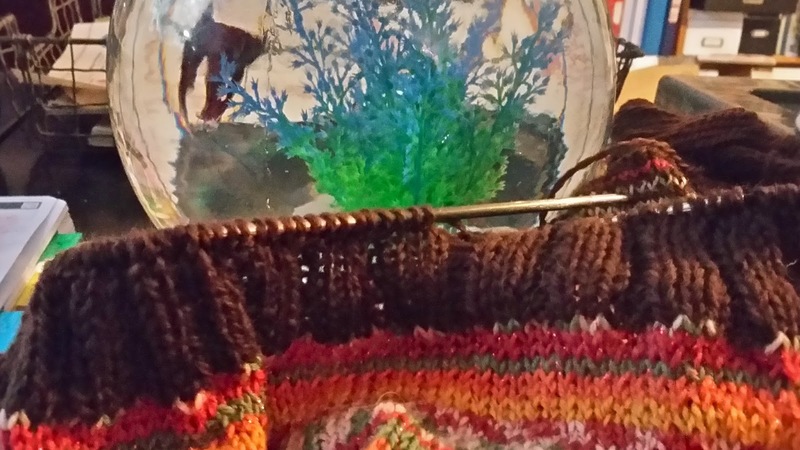 Meanwhile, New Fish is enjoying watching me knit. Me, knitting one row a day. Good grief, I forgot how much of my knitting time the summer job takes up. We also finished reading Black Woods. I really enjoyed it and the surprise ending was... well, a surprise! I totally expected it to go a different way. And even the surprise ending had a surprise ending. An ending which is making me consider calling out from work today so I can stay home & read the next book in the series. 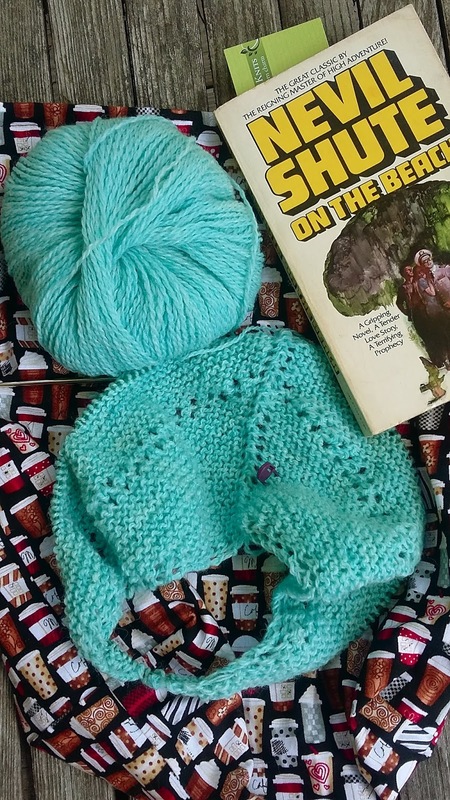 Join Ginny's Yarn Along over at her blog, Small Things, to catch up on what others are knitting and reading. It's been quite a week. The rain finally stopped, the sun came out (and brought the heat and humidity with it) and work has been fun in that horrible but exciting, I-can't-believe-we-survived kind of way. We've had power outages, team meltdowns and wonderful moments when the team worked together to accomplish the impossible. It's been fun. But it's also been incredibly busy. 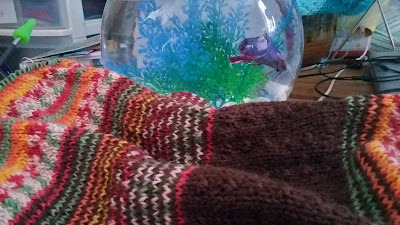 Because of work, I haven't gotten much knitting done. I have the feeling that's going to be the case for most of the summer. 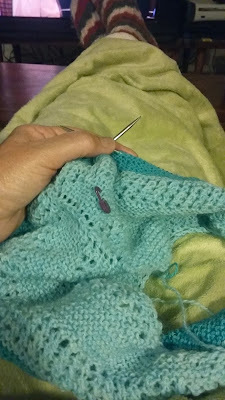 I've been knitting on my Reyna shawl almost daily, except by "knitting on" I mean I've knit a few stitches each day. 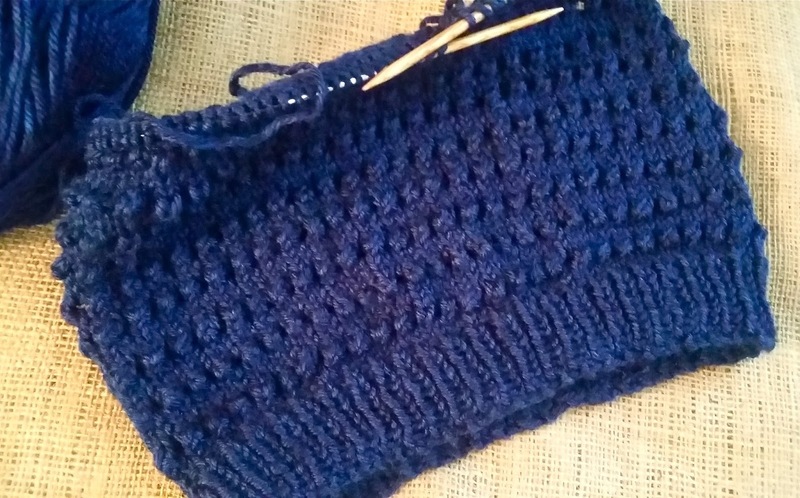 Stitches, not rows. I really haven't made much visible progress on it. I was able to get almost five inches knit on my cowl and I finished reading On the Beach and started Black Woods (another free Kindle book.) According to my Kindle, I read 60% of it while on machine babysitting duty. I'm thoroughly enjoying it. Although.... I have to admit, it did not help my nerves at the end of the night. At the end of the night, I had to walk through the darkened park alone. It was terrifying. Have you ever walked alone through a darkened theme park after hours? Theme parks are such a happy place during the day, but at night... At night when the lights go out... With the lights out, theme parks become THE most terrifying place on earth. 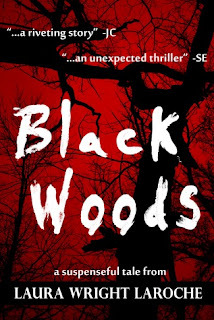 I was fairly certain the Black Woods beast was stalking me along with every single clown, spider and/or creature Stephen King has ever thought up. 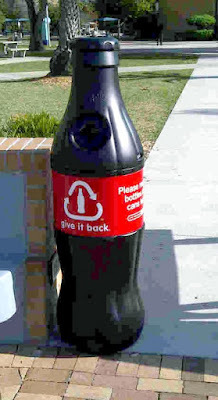 I'd also like to point out to Mr. King (to all horror writers for that matter) that they are missing out on another truly terrifying thing-in-the-dark - the Coke-Cola recycle bin. You've never known true fear until you've come face to face with a man sized Coke-Cola recycle bin in the pitch black dark. But enough about heart stopping fear. 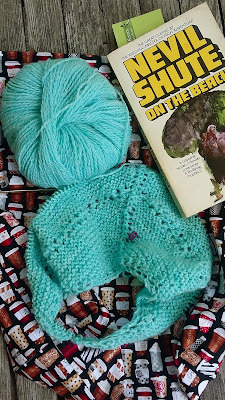 Join me and many other knitters over at Ginny's Yarn Along to learn about what everyone else is knitting and reading. My modified Reyna has been put aside because I'm trying to be a responsible Etsy shop owner. 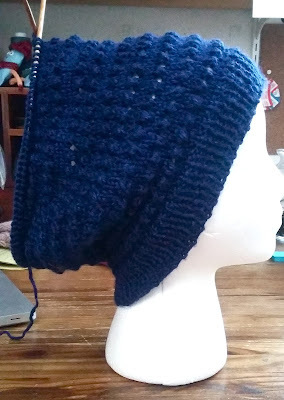 I'm dangerously close to being sold out of one of my most popular hat designs so I'm spending my non-working-at-the-theme-park hours frantically knitting more. Doesn't look like much when laid flat, does it? Miss Creepyhead modeling it in bad lighting doesn't improve things much. But soon... soon it will stop raining and I can get a decent photo taken with decent lighting. 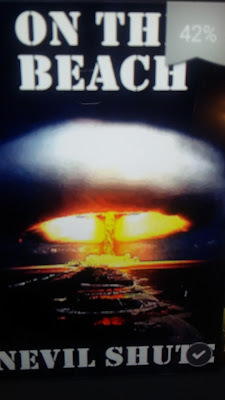 "Happy D-Day" just doesn't sound quite right. 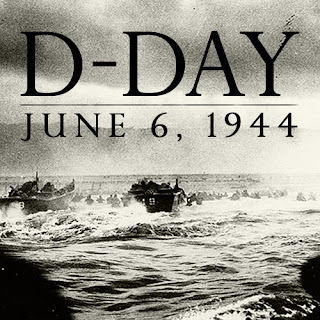 Instead of knitting, I'm having a moment of silence in remembrance of the brave men & women who have given so much to keep us safe and uphold our freedoms. People like my dad. Dad didn't land on Omaha Beach until June 7th, 1944 but he still experienced plenty of action and left this world a few years ago, still carrying a bit of german shrapnel in his leg. Thank goodness for Ginny's Yarn Along. The 'season' has begun at work, the hours are long (I worked 43 hours Memorial Day weekend) and the knitting time is short. But Ginny and her Yarn Along have given me purpose. Admittedly, I'm only a few pages further into On the Beach. There just hasn't been much time to read. There hasn't been much knitting time either. Although I already had way too many projects on the needles, I couldn't resist starting another Reyna. Or, I should say, a Reyna-like project. I loved the simple open lace plus garter stitched areas of Reyna but I prefer rounded/crescent shawls to triangular ones. There's just something about the triangular shape that either makes me feel like I'm 95 if worn shawl style or like a cowboy if worn scarf style. So, I'm doing the Reyna row pattern but on a semi-circular shape. With stripes. 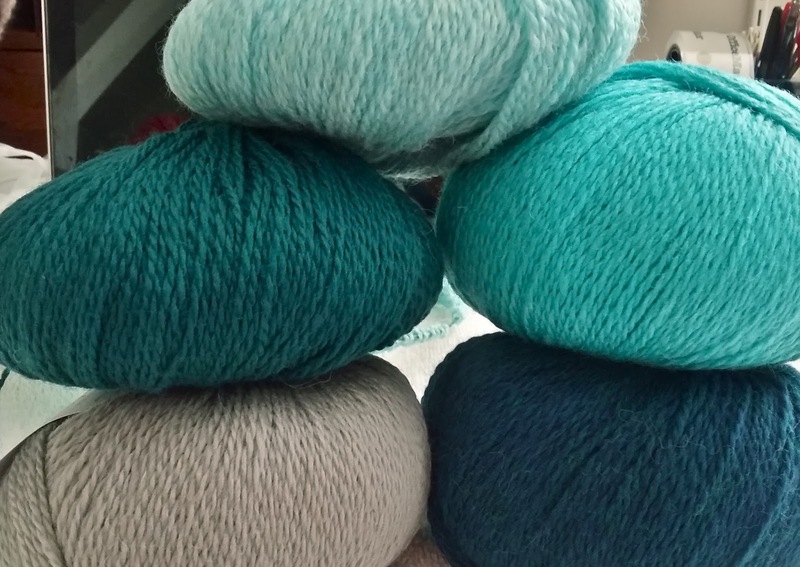 Although I have several yarns in the stash pile that would be perfect for a Reyna shawl, they all needed to be balled. I was lazy and lacking in time so I grabbed a few coordinating already-balled skeins and, well, we'll have to wait & see if stripes were a good idea or not. I'd also love to add some beads but..... beads are time consuming. Time is something I do not have these days. Maybe if I'm still knitting on this one come fall when my work season ends, I'll do some kind of beaded bind off. We'll just have to wait & see.